When you’re trying to raise your testosterone levels you’ll need to look at every aspect of your lifestyle. You know you need to train hard and lift big – you also know that you need to eat healthily. But did you know that there are certain foods that can elevate your T levels higher than others? Optimizing your diet can really make a difference so your choice of food can either dramatically boost your progress or just help you to tick along. With many people choosing to miss breakfast due to overly busy lifestyles or lack of early morning appetite, we want to give you the low down on quick and simple breakfast foods that you can eat that to make a difference. Having optimal testosterone levels improves your athleticism, health and body composition. If you are finding that you feeling sluggish in the gym, your progress is starting to slow down, or you feel that you need that little extra push to achieve your goals then elevating your testosterone is key. When you’ve decided that you want to boost your T levels, you need to train hard but also look for the best foods to kick off your day in a good way. With so many different ones to choose from though, the task can be a little daunting. By choosing the right breakfast foods you’ll give yourself more energy and drive throughout the day. You’ll deliver key nutrients to start the muscle growth process and you’ll help your body partition incoming energy to muscles and not store as fat. There are hundreds of foods that will raise your T levels. The problem is that not all of them suit an early morning meal. Whether that’s because they take too long to prepare, or just because your palette wouldn’t like the taste so early in the day, you need to think about which ones optimize your hormones best. You really can’t go wrong with eggs if your goal is to elevate your T levels. High in fats and protein, this food is packed full of vitamins A, D and E as well as the mineral selenium. 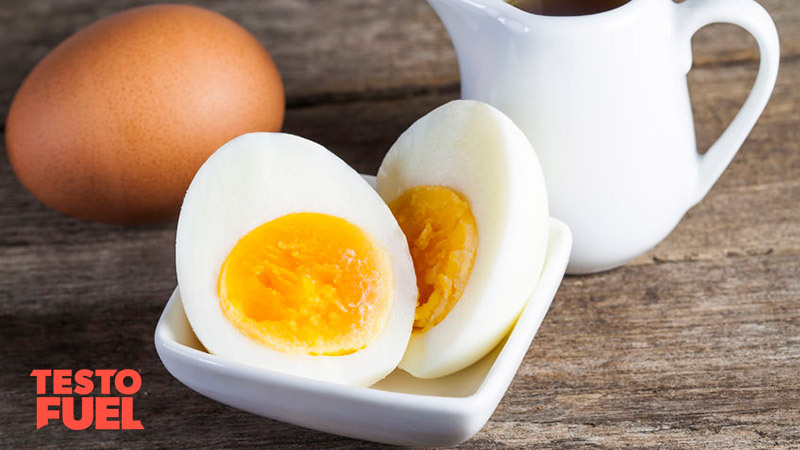 You’ll find a ton of cholesterol in the yolk of the egg – and whilst you might think that this is bad for you, cholesterol is essential for manufacturing testosterone. The yolk is also particularly high in the more healthy HDL cholesterol too, meaning that you’ll boost heart health at the same time. Those on low fat diets with limited cholesterol find it much harder to add muscle mass so it’s important that you do everything you can so give your body a morning boost with egg-based breakfast meals. The yolk will also provide you with 50IU of vitamin D3 – a potent vitamin which boosts muscle mass, recovery and endurance. Breakfast Tip: Whether it’s omelettes, scrambled or boiled eggs, this food is a great, versatile morning meal. 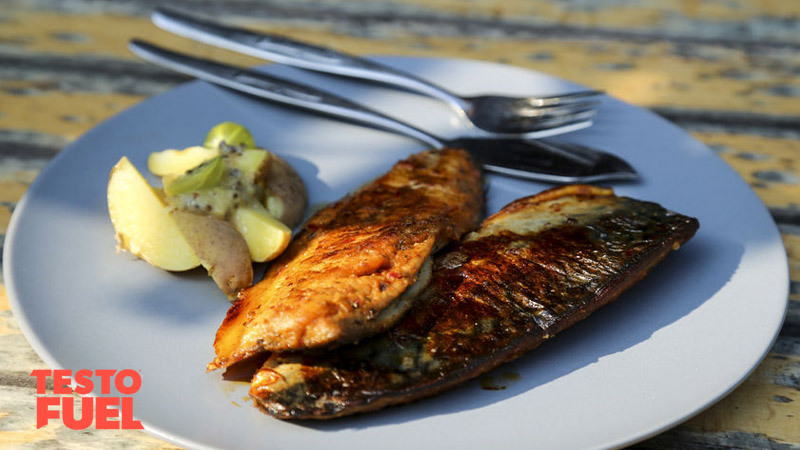 Mackerel is the common name used to describe a number of different species of fish. It is high in vitamin D, has a good balance of major fats and cholesterol, and gives you a fantastic hit of protein too. It is also relatively low in calories. 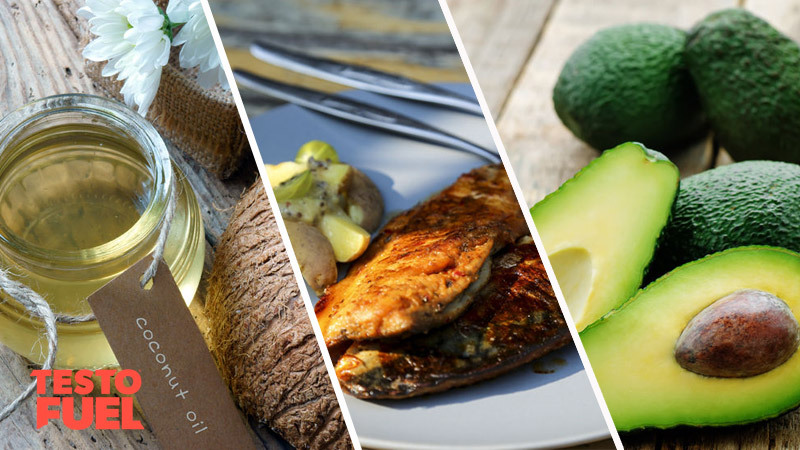 As we’ve already mentioned, fats are important building blocks for steroid hormone production, and the unsaturated fats are heart healthy and boost insulin sensitivity too. Studies have also shown the omega 3, essential fatty acid content can boost luteinizing hormone levels – an important trigger hormone for T production. You can eat it plain, smoked or peppered, so you can go for your early morning taste preference here. More importantly you can buy it ready prepared which reduces time in the kitchen in the morning. Breakfast Tip: Mackerel works perfectly with scrambled or poached eggs on toast, or even on their own. This vividly colored berry is not only sweet and tasty, it’s packed full of nutrients that’ll get your hormones soaring. Full of vitamin B12, K and C, the pomegranate contains bioactive compounds such as anthocyanin and punicic acid which are potent antioxidants associated with decreased inflammation and improved blood glucose regulation. Studies have found that pomegranate can improve salivary testosterone by 25% over a 2-week period and can improve a number of sexual performance parameters too. 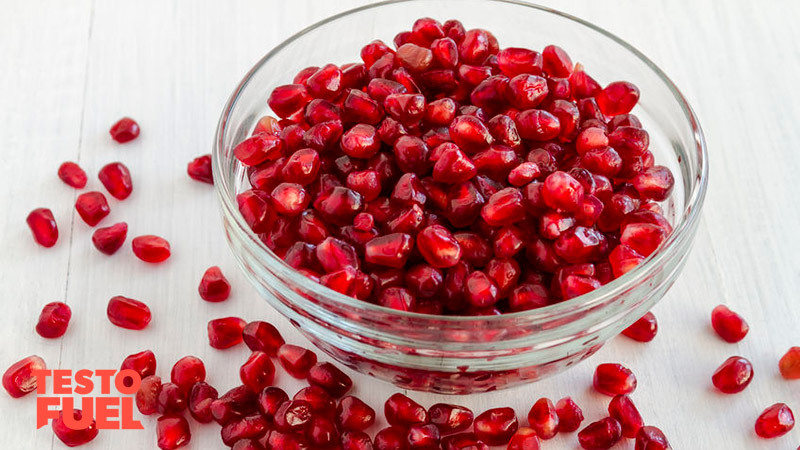 Breakfast Tip: Great as part of a fruit salad, sprinkled over oats, or you can simply add pomegranate juice to a smoothie. This fruit is a perfect ingredient for breakfast. You don’t get many foods with such a packed nutrient profile. At 80% fats, this intensely-colored green fruit is loaded with essential fatty acids, folic acid and a host of vitamins and minerals. From the high fat content you’ll get all major fat types – both poly and monounsaturated as well as saturated. 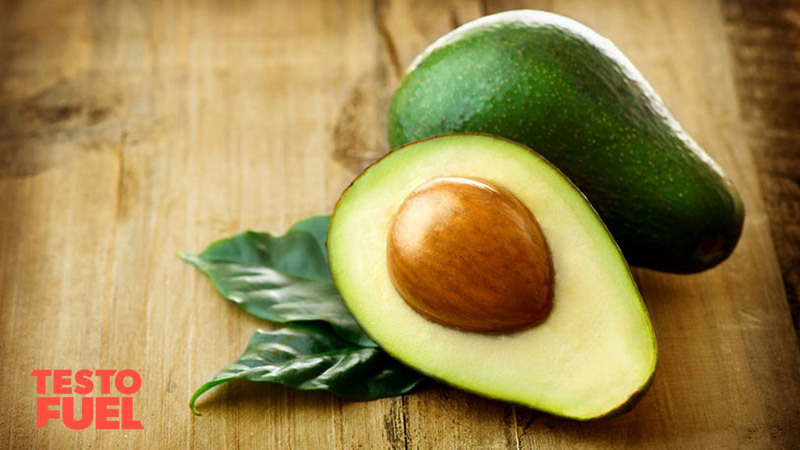 As steroid hormones are synthesised through the conversion of cholesterol, the avocado offers a significant T boosting effect that you’ll not want to miss. At 1.7 kcal per gram this food will also give you a great start to the day by providing you a big hit of energy in such a small volume of food – perfect for those that prefer not to eat a lot in the morning. Breakfast Tip: Great to eat on its own, blitzed into a creamy smoothie with some almond milk, or even better combined with a fried egg, the avocado is a food not to be missed. A handful of nuts is one of the quickest and most effortless breakfasts you can think of – particularly for someone who is always on the go. Providing you with a range of nutrients and fats, nuts contain tocopherols which have been shown to boost prostate health and improve blood lipid profiles. They also have a high polyunsaturated fat content which works as an active anti-inflammatory, helping to reduce the risk of cardiovascular disease risk and other associated illnesses. 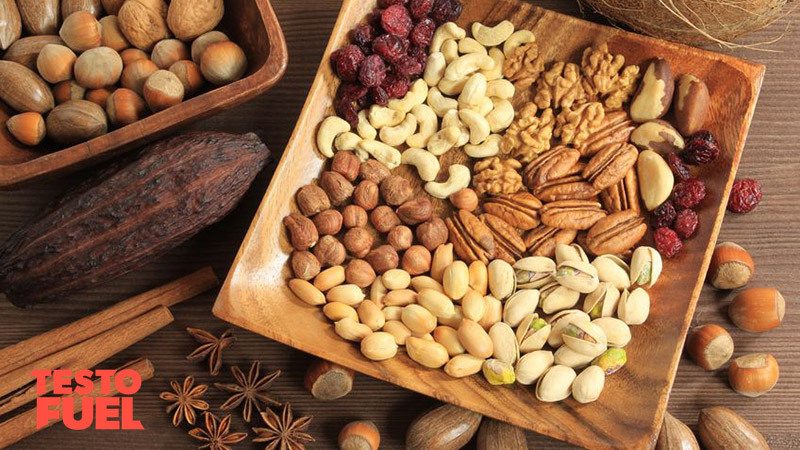 High in zinc and magnesium – both important for stimulating the production of testosterone – nuts are a geat food to add to your T-boosting diet. Breakfast Tip: You can add nuts to practically anything – great on oats, granola or omelettes, this versatile food also works well with meat too for those wanting to maximize protein intake first thing. 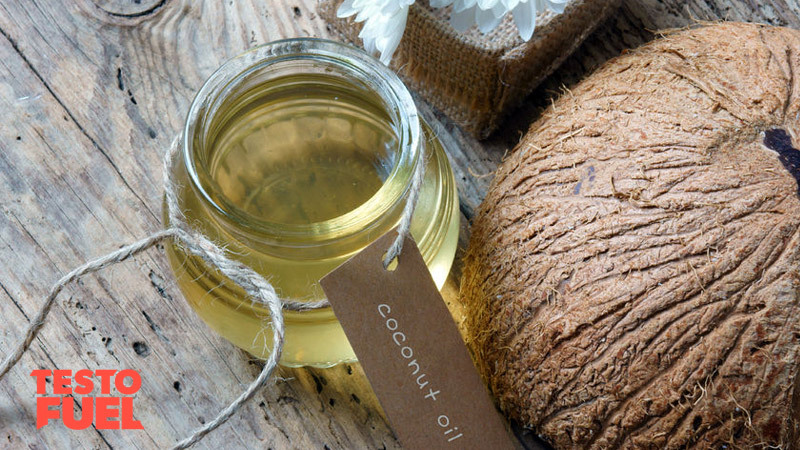 We’ve added coconut oil not as a food to eat on its own, but as a simple testosterone boosting ingredient to cook with. Providing a high source of saturated fats, this food offers cardio-protective benefits that can improve overall long-term health. But what makes this fat source different to eggs, fish and nuts is that is much higher in medium-chain triglycerides (MCTs). This type of fat is much easier to breakdown in the liver and used as instant energy, meaning you’ll feel energised and raring to get your day underway. Coconut oil has been shown to activate key enzymes used in testosterone production, and also boost metabolism. Breakfast Tip: Cook your breakfast foods in coconut oil to boost key enzymes used in the T production process. Eggs taste fantastic with this MCT-rich ingredient – as do oats and even fried bananas. When you’re trying to boost your testosterone levels you’ll really need to analyse your lifestyle, exercise and diet. Breakfast provides a perfect opportunity to get your day off to a good start by giving you chance to maximise hormone production for the rest of the day. Foods high in nutrients such as zinc, magnesium and vitamin D are great for stimulating production of your male hormones, whilst at the same time improving heart health and metabolism. What Increases Testosterone the Most?